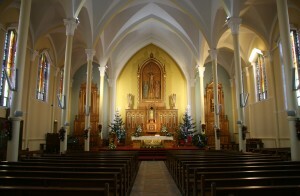 Special masses will mark 50 years of the current parish church in Blackrock, Cork. St Michael’s Church replaced the far older Church (140 years old), which was destroyed by a fire in January 1962. Back then there was a huge effort from the parish to raise the money needed to rebuild. The then Parish Priest, Canon Dan O’Donovan was an experienced fundraiser and managed to persuade people from every part of the city, and all walks of life, to go on the committee. For example those involved included the Lord Mayor and City Manager, the General Manager of the Munster and Leinster Bank, Ben Dunne Senior, sporting legends Eudie Coughlan and Jimmy Bruen, three local Doctors and parishioners. “There was of course frenetic activity within the parish and every possible source of fundraising from bazaars to cake sales was undertaken. Children and adults alike worked to raise money and each household contributed through a weekly door to door collection. 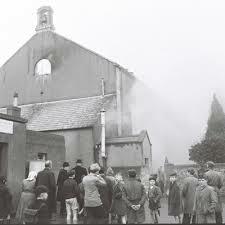 Within a year of the fire, £97,286 had been raised and the cost of the Church, £115,000 (about €15m in today’s terms), was more than covered by the opening in 1964,” said Eoin Gunn. 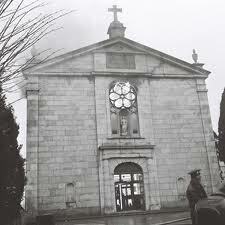 In more recent times approximately €1m was raised to maintain the structure of the church and refurbish, showing that today’s generation was not found lacking on the funding front. The Jubilee celebrations begin this week with special masses from Thursday to Sunday. The actual Jubilee is the 7th June when mass will be celebrated with Bishop Buckley. Cannon Jim O’Donovan and Fr John O’Donovan nephews of the fundraising priest in 1962 Cannon Dan O’Donovan will also be present at the mass. Likewise friends, family, and parishioners from all the generations will be present either at the Jubilee mass or one of the others during the celebrations. Other events will occur during the year – among them a parish exhibition and book. Organisers are appealing to parishioners for any old in relation to the church to include in these. 7.00 pm Rosary, Sermon and Benediction. 7.00 pm Rosary and Benediction. 6.00 pm Jubilee Mass followed by refreshments. 11.00 – Mass – Thanksgiving for the Future with Confirmation classes followed by refreshments.